Today my friends it is Christmas Eve’s Eve andthe kids are so excited they are busting at the seems!!! Bryce just can’t contain his excitement and Madison & Naomi can’t wait to bust into those presents of theirs! 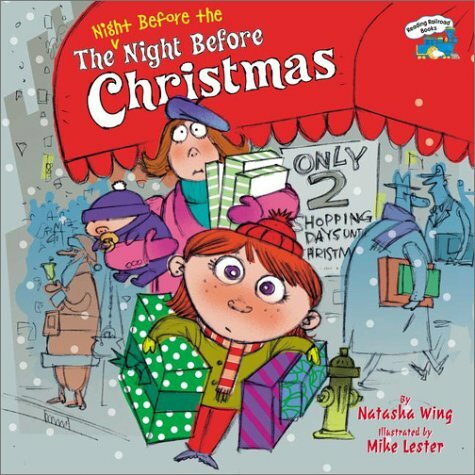 Tonight the kids and I’ll read Natasha Wing’s, The Night Before the Night Before Christmas…we love ALL her books and I like to add about 2 or 3 a year to our growing collection! Today Jer and I are having our “day-date”, finishing up our last minute shopping (I changed one of Bryce’s presents last minute, last minute-I know) getting groceries of course and needing to finish wrapping presents! Last weekend we received a nice dusting of snow and it really made this area look like a winter wonderland. Snow makes everything look pretty! I suited up before the kids got up and set out with my camera…oh and the dogs if you couldn’t tell by their tracks. The sun was shining, everything was so clear and bright! At this point my fingers were now freezing. I loved how the sun was shining through by the calf barn. Harley was loving the snow and has been doing so well this winter! This is his second Missouri winter and this time he’s all, don’t worry Mom-I got this! After I went back inside I didn’t let the kids come right out, I wanted them to stay inside a little longer, eat breakfast, watch some cartoons because it was FREEEEEZING outside and I knew they would get cold quick! So after about 30 minutes of getting them suited up with new snow suits & snow boots, which were going to be for Christmas, they were finally ready to head out the door! The dogs were excited to see the kids running around and the girls wanted to chase them. The kids really wanted to go sledding but, we didn’t get enough snow for that…maybe next time!?!? 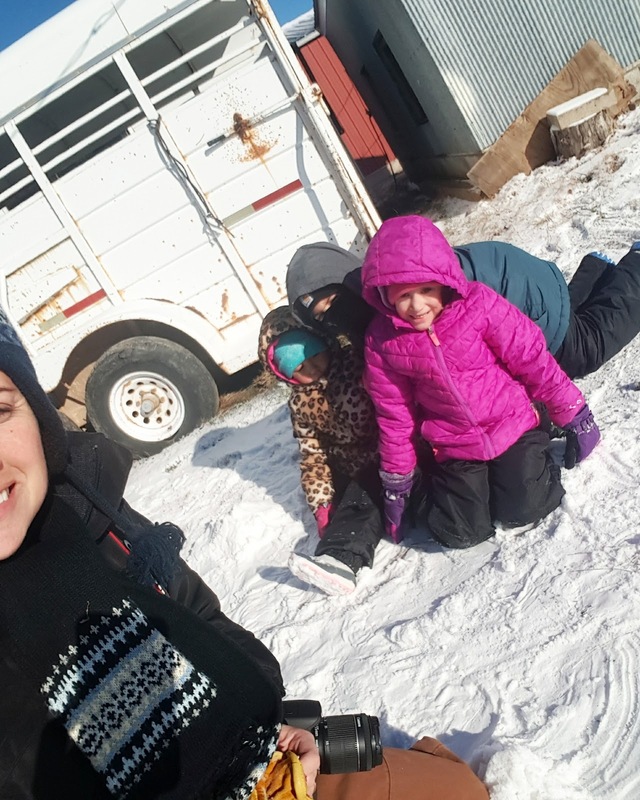 While it was snowing overnight, the wind was howling and the way the snow had come off the top of the calf barn made a nice powdery-pile for the kids to play! It wouldn’t be complete without making snow angels! That was our snow day! See you all Monday, Have a GREAT Christmas weekend! I know…Holly would of freezed! She probably wouldn't of wanted to pull her sleeves up in that weather! Making memories . . . enjoy this day and season! Love the snow pics and the dog prints in the snow. . . oh and those snow angels too : ) !! Dog prints in the snow are the best and the angels too! I hope you all had a great Hawaiian Christmas! Merry Christmas! 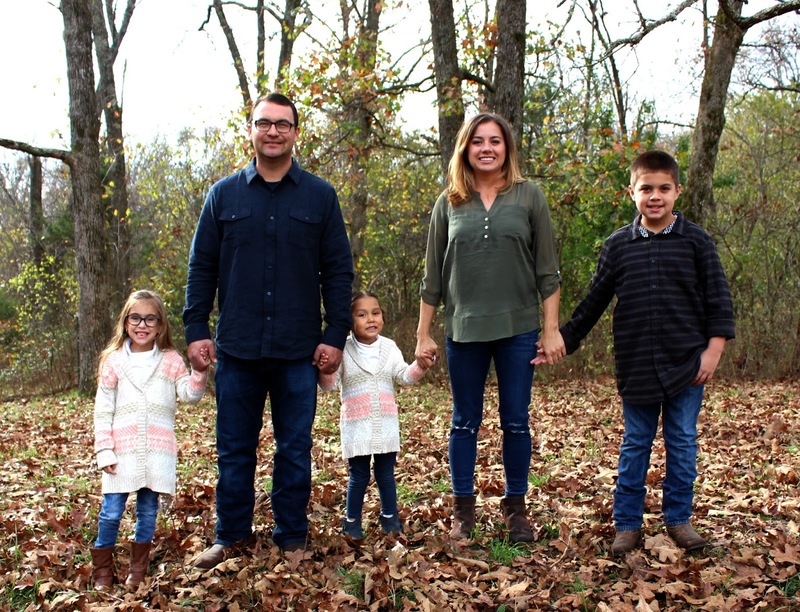 Great job on your Christmas pictures! Merry Christmas Heather! Thank you, I really didn't want to pay someone $200 to take our pictures. Especially because Madison is done with pictures quick, haha! !